Each piece in this 4 piece stacker is a different shape and contains its own activity for children to explore. The large cube has a spinning color wheel inside, the hexagon contains a ball, the triangle has colored beads and mirrors, and the ball on the top is a squeaker. 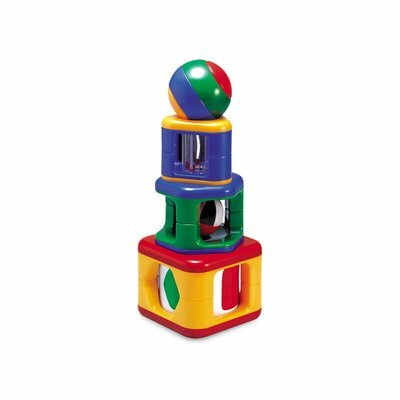 Made of multicolored durable plastic, this toy teaches colors, shapes and cause and effect, while building manual dexterity and hand-eye coordination. Tolo Toys award winning designs, bright colors and cute characters make growing up fun. Specially designed to stimulate a child's interest and curiosity, these toys encourage important developmental skills, while upholding high standards of safety and durability. Each piece can be played with separately.